I love the ruffles and pretty eyelet details of this daisy embroidered pintuck top. I ordered size XXSP since it runs bigger. I do wish the length was a bit longer so I may order size XSP to compare. If you have a larger bust then I would recommend sticking to your usual size at LOFT since the bust is narrow and the pleats may pull too much. Update 4/20: A similar sleeveless version is now available! LOFT‘s friends and family event has been extended! Use code FRIENDS to get 40% off everything. Valid in stores and online. LOVELOFT cardmembers also enjoy double points now through Sunday. 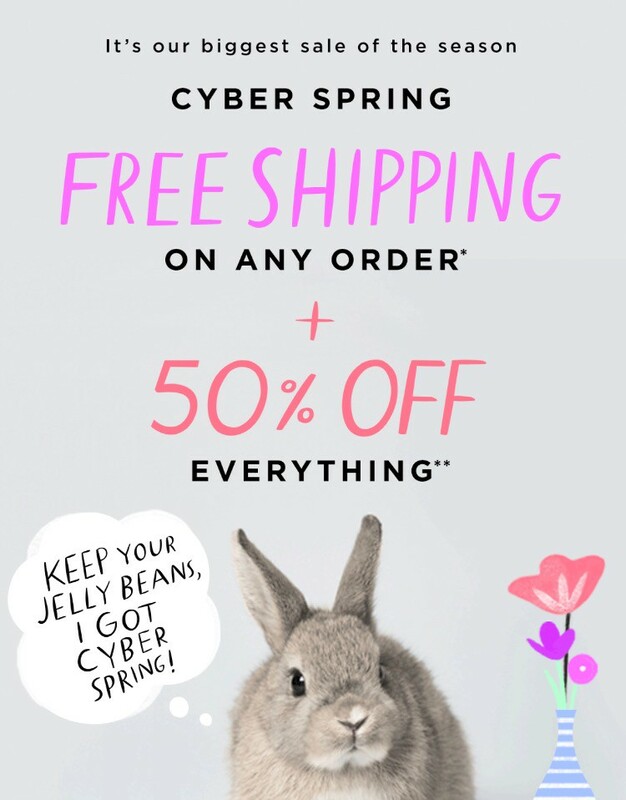 Update 4/15/17: Get 50% off everything at LOFT plus FREE shipping with code CYBER. Valid online only. I ordered this pretty grey floral lace bell sleeve top in size XXS to try even though my online True Fit profile recommended size XS regular. Yesterday, my mom also asked me to order the cropped skinny chinos for her (review here) in the serene blue and castlerock colors and now I can send them directly to her place with the free ship. 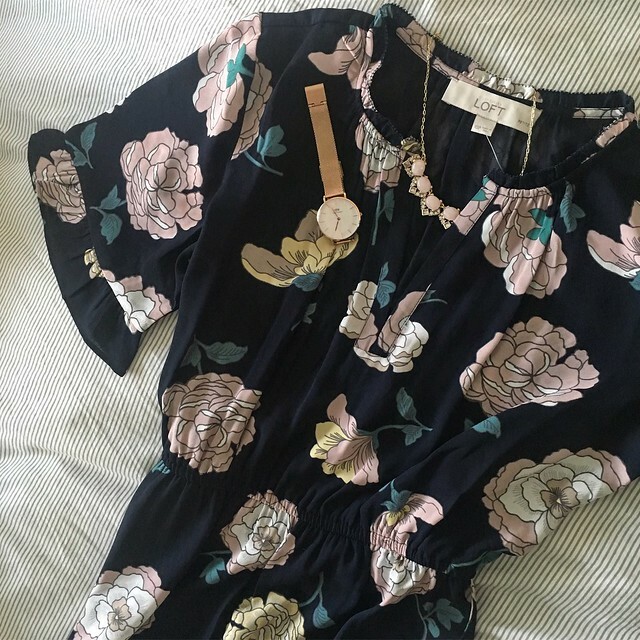 I received my most recent order last week (I typically share quick updates and sale alerts on my Instagram stories) and the only dress that fit me decently was the peony split neck dress (pictured above). See it on me here although my husband photobombed my Instagram story. However, I would prefer size XXSP but size XSP looks fine if I cinch the waist tighter. I’m still hoping my preferred size will pop back online so I can exchange it for the best fit. As for the other dresses I ordered, the ruffle maxi dress and leafy tank dress were too long in the torso on me (I’m 5′ 2 1/4″). I had ordered both of them in size XXSP but they felt like size XSP so I would suggest going down one size. I was expecting the elasticized blouson waist to hit me more like an empire waist (as seen on their models online) but the waist of these dresses started at the top of my hip bone/belly button which wasn’t flattering given my straight figure. The maxi dress also runs long (see it on me here) so if you normally take regular missy sizes then you may want to order it in petites to prevent the length from dragging on the ground. This one shoulder top is absolutely gorgeous and not too see through but it does run one size bigger. Size XXSP fit me really well. See this top on Su. I’m always on the look out for cute spring layers and this bell sleeve jacket is a great lightweight option over sleeveless dresses and tops. 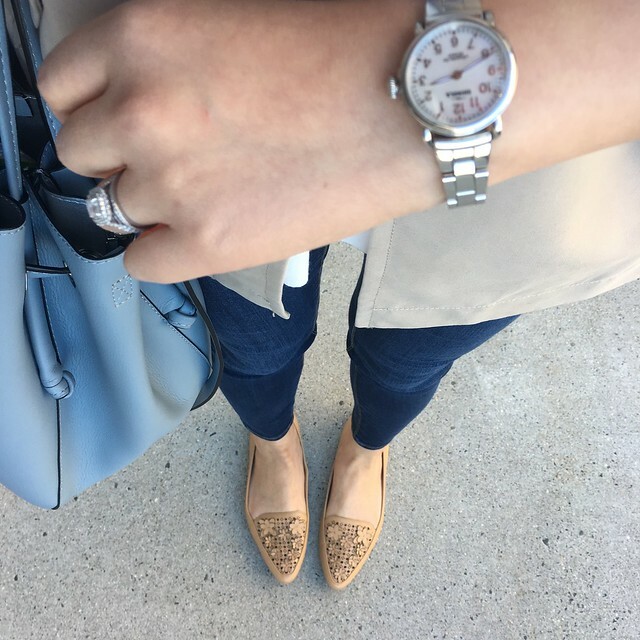 I love the greyish neutral color. I found that this jacket fits true to size and I like the cropped length. 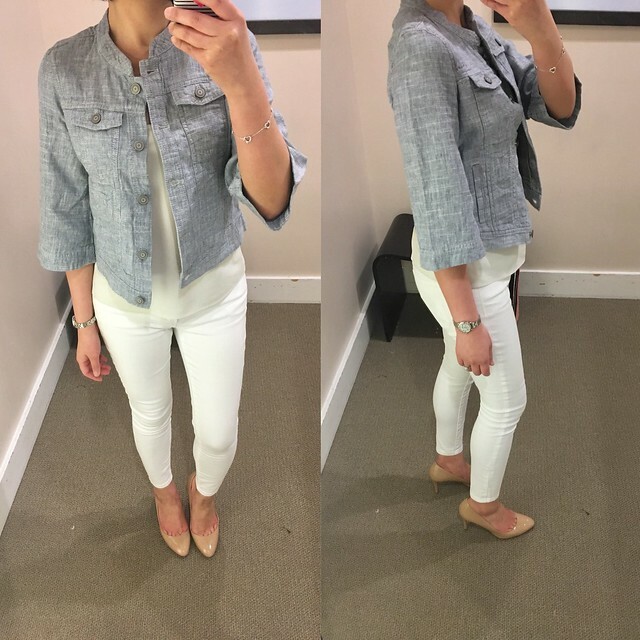 Speaking of spring jackets, I just ordered this white puff sleeve denim jacket from Ann Taylor in size XXSP and I hope it works out. These striped shorts are just darling but they run big. My online True Fit profile recommended that I take size 0 regular but I found that it runs big and loose so I probably need these in size 00 regular. See the side view on me here. The back of the waist is stretchy so you could size down safely for a better fit without ending up with a muffin top. My feet were killing me by the end of the night so I took the pictures with my heels on to spare you my red toes but I would wear these shorts with flats or wedges. 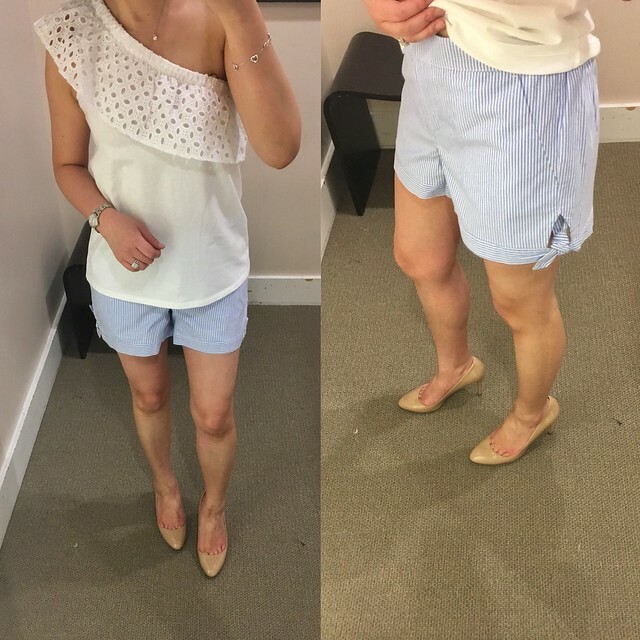 I’ve also been eyeing these ruffled seersucker stripe shorts from J.Crew. 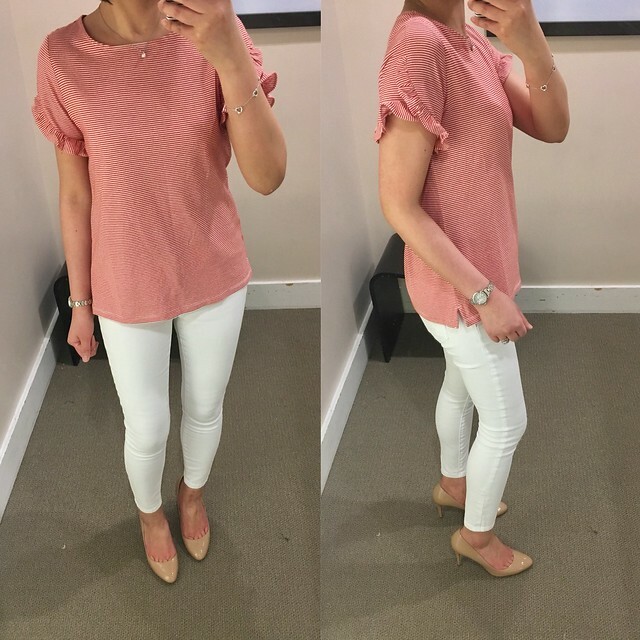 I’ve been wanting to try this tulip sleeve tee in petites and I finally came across size SP to try. I would prefer my usual size XSP for the best fit. 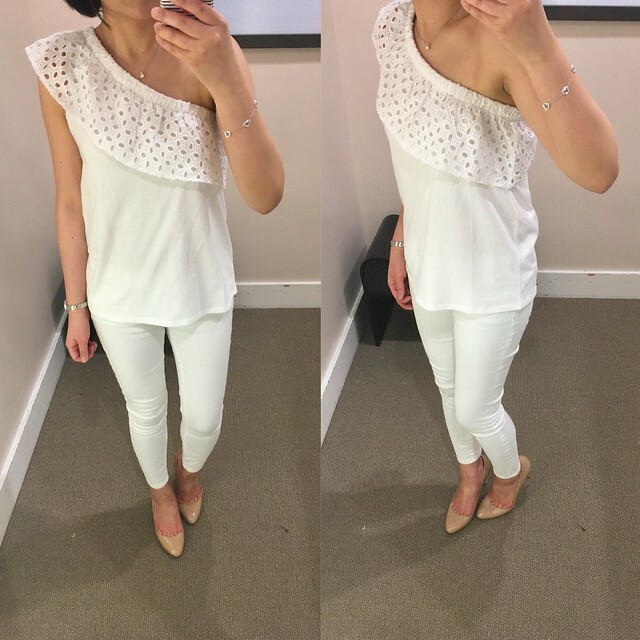 The neckline and waist of size SP was a bit loose fitting on me. I intended to buy a few items but I didn’t have enough time to find everything and figure out if it was $100+ after discounts so that I could use my Ann Cares card for additional savings. 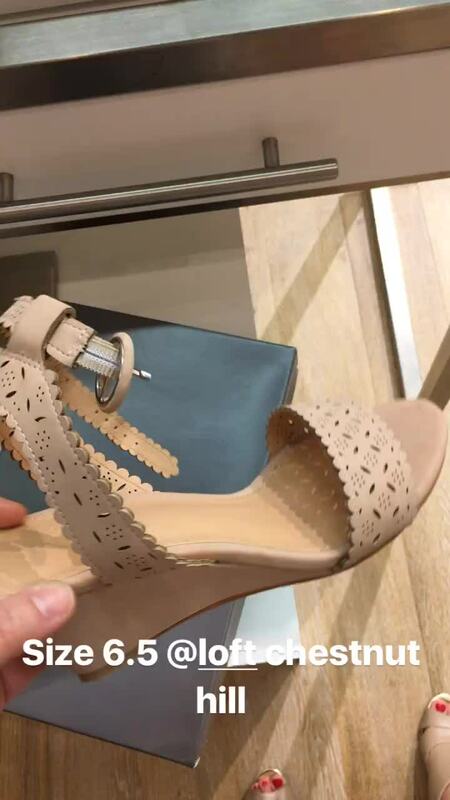 Update 4/16/17: I saw these gorgeous cutout wedge sandals in store Friday night while doing a return and I love the neutral color and comfortable heel height. The straps are soft and comfortable and they’re also very well made. I’m glad I was able to see them in store (someone likely returned them) to help me decide which size to get. I tried on size 6.5 as you can see here but I ordered size 7 with the Cyber Spring event today since my feet tend to swell when it gets hot.